material planet, but that we are whole beings, each a miniature cosmos, each related to all of life in intimate, profound ways, should radically transform how we perceive ourselves, our environments, our social problems. Nothing can ever be isolated from wholeness. Vimala Thakar was a social activist and spiritual teacher from India. Seed questions for reflection: How do you relate to the author's notion of the force of love being the force of total revolution? Can you share a personal experience of a time you realized that you were a whole being, related to all of life in intimate, profound ways? What helps you experiment with the impossible? 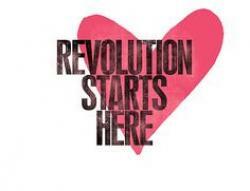 The love that is the force of total revolution is the awareness and realization that we are one -- one with one another and with all that is -- and that what we do to any being, living and not living, and to this planet that we are part of we do to ourselves. With such love we live in I-Thou rather than us-and-them, we live in compassion rather than indifference or worse, we live in cooperation rather than competition, we live in peace rather than war. My realization that I am intimately and profoundly related to all that is began long ago and deepened as I discovered wisdom of the Far East and particularly wisdom of the Vedanta tradition. I don't know what is impossible. I know that what is possible is much greater than what we think is possible. Our capacity is much greater than our thinking. I've been wanting to write something pertaining to the state of the political environment and how destructive it is, but the bottom line sums it up in this article-love needs to arise. We see ourselves and everything else from a position of separation, a dualistic thinking. If only we saw the divinity in each other starting with ourselves. Thank you Vimala for this beautiful piece!